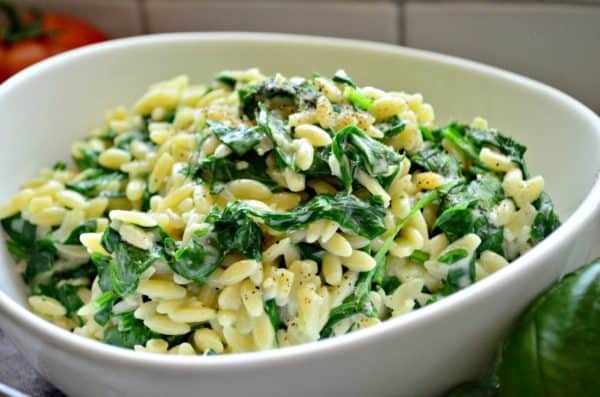 Creamy Parmesan Orzo with Spinach is the perfect side dish that compliments just about any protein you serve it with. It could also be used as a main dish and topped with grilled shrimp or crispy bacon. Looking for an adult version of mac and cheese? 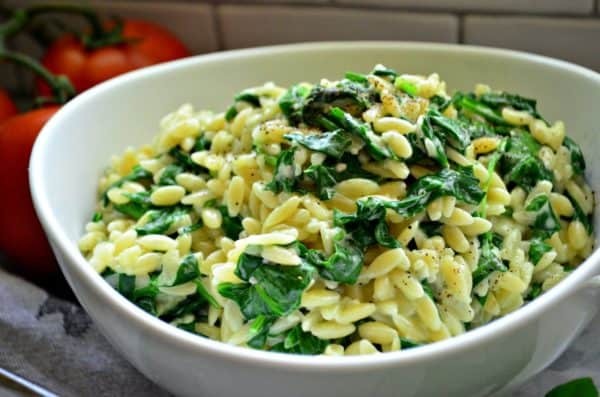 You’ve found the answer– it’s my Creamy Parmesan Orzo with Spinach. I love to entertain with this side dish. I always describe it as an adult mac and cheese and people don’t get it until they have their first bite. That’s when they gobble it up and ask for seconds and sometimes thirds. Even my kids love this dish–so don’t think you can only make this for adults. I was first inspired to make this dish back in 2016 when we took a Carnival Cruise. One of the evenings in the main dining room, I had this amazing creamy orzo and spinach side with my dinner. I devoured it and knew I needed to recreate it when I got back home. Over the past two years I’ve been making this side dish for my family, and had never shared it with my readers. I know–shame on me. I’m so glad that I finally took the time to measure out and write this recipe. How do you make cream sauce? For this recipe, I start by melting butter in the same pot I cooked the orzo pasta in. Then I cook the minced garlic in the butter for one minute, stirring often to prevent it from burning. Next, I pour in the heavy cream and season it with salt and pepper. You can add in the Parmesan next or I prefer to add in the noodles and then the Parmesan cheese. Then, you stir until all the cheese is melted and the sauce is creamy. How do you sneak vegetables into pasta? 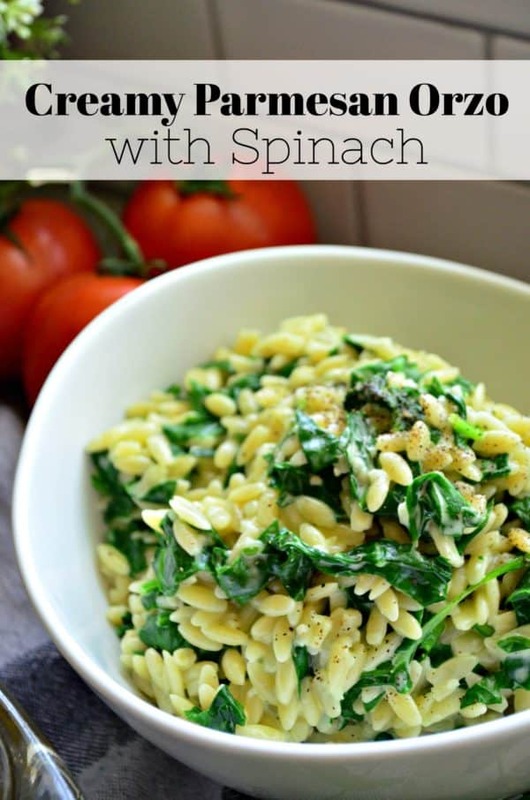 This is the one recipe that my son does not complain about eating spinach. The key–chop it very tiny so it’s hard for your kids to try and pick it out. Once they have a bite and realize it tastes similar to mac and cheese and are overcome by the creaminess they will just eat it up. It’s a great way to sneak in spinach. I mean let’s get real–it’s fully visible but you get my point. 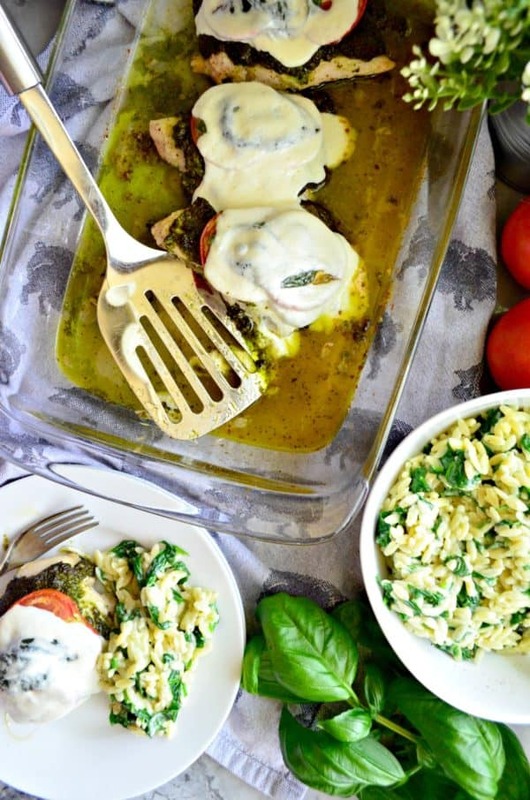 I love to make this pasta side dish with my caprese pesto chicken. I’ll also roast asparagus while the chicken bakes in the oven. If I’m entertaining, I’ll serve a salad too. 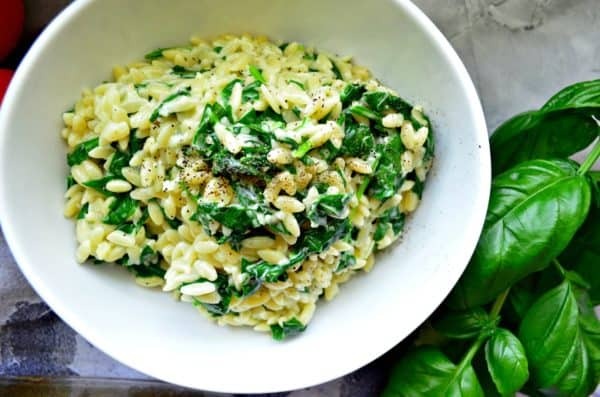 So if your looking for a new side dish recipe or maybe even a main dish that you top with some crumbled bacon and roasted veggies then give my recipe a try for Creamy Parmesan Orzo with Spinach. Cook orzo pasta according to package. Drain and rinse and set to the side. Return the sauce pan back to the stove top. On medium heat, melt the butter then add in the minced fresh garlic. Stir until fragrant about 1 minute. Then add in the heavy cream, salt, and pepper. Add the cooked orzo back into the pot, mix well. Then sprinkle with Parmesan cheese and begin stirring in the fresh spinach. Continue to add the spinach until all of it has started to wilt.